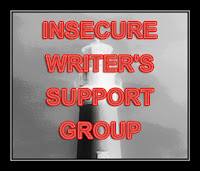 As you know IWSG is hosted by Alex J. Cauvenaugh. So what an I insecure about? This short story I was supposed to have finished two months ago. I fear the middle is sagging and it's just a short. Geez. My new blog project on this blog and my new blog, both of which you can find out about here. (If you have something to promote this year, I recommend you check out that post). Then there are the queries and fulls I have out, and the grad applications that have not yet been answered. So much uncertainty. And God I hope this short story turns out decent to good-ish. Okay, back to writing. Bye, bye, bye! And tanks for visiting. Good luck with that story and Happy 2013! I know that you will get the short story worked out. Just hang in there and all the best for 2013. Take a deep breath. You just need to take a break and then go back fresh. That short story will be great. Keep writing!